Sometimes I just can’t bear an unhappy ending. I started to watch The Changeling last night and it was quickly so upsetting I knew I couldn’t bear it if it got worse. I googled the story it was based on, the Wineville Chicken Coop Murders, and mother of God, that is the worst story I’ve read in a long time. I immediately deleted The Changeling and watched 13 Going on 30 instead. I think I’ve uploaded different versions of this picture before. Every time I walk up Broadway and see this view I have to take a picture of it. That’s the Chrysler Building of course, but to the right is the Grace Church spire, and to the left, that triangle thing, is one of the Zeckendorf Towers. My favorite version of that view is from further down Broadway, looking uptown. 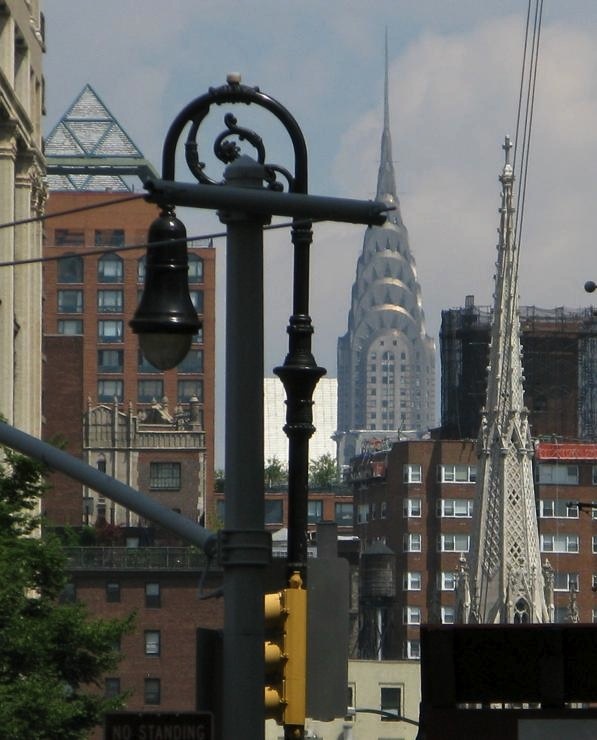 You see Grace Church at the bend in Broadway, with the Chrysler Building hovering directly above it. Always gets me.